Hoping you are all doing well and being productive. And escaping this heat! Oh my goodness. 5 years and I'm still not used to it. Anyway, because there's an actual point to this post, I'm gonna get into it. One of the great things about having a group of artists in an area are the awesome opportunities you get to not just hang out, but learn from each other! The time that I improved over the shortest amount of time was when I spent every weekend with a local group in the San Fran area called B.A. A.U. , short for Bay Area Artists Unite. B. A.A.U. was just a group of artists, just like us, who shared a common interest in comics, cartooning, and animation. Some of them attended my school, others were completely self taught, and ALL of us loved hanging out. We would sit in an open area of a mall in Japantown and, well...draw! Doing this, we shared methods, taught discoveries and different ways to do things. Those who weren't in school learned things the art students learned in class, and we all encouraged each other to keep drawing. Essentially we taught each other to improve. I think it was this group and doing things like this that I miss the most about California. I made lasting friendships and saw my skill skyrocket. Just because I was having fun! I suppose the point of this long winded proposal (I can write novels sometimes), is wondering what you all thought about doing something like this? It, of course, doesn't have to be every week, maybe once a month or once every other month. Doesn't mean there can't be any "unofficial" meets if people want to get together more than that. Now, we likely won't be able to reserve an area, but I also know that there is nothing that states we cant meet up on our own either. And because Josh works there (Hopefully I will be as well soon! Fingers crossed!) I will know ahead of time if there are any library programs happening in the Plaza, so we can figure out a time to gather where we wont be stepping on peoples toes. I would have no problem gathering more information, as well as looking into things people wish to learn more about (like figure drawing and anatomy, or computer programs, or different media to work with). This, of course, all depending on what you guys think and if it sounds interesting to anyone. So let me know! You guys have any ideas, too? Speak up! We've all got nothing to lose and a lot to gain! Hey, all. Did you know that your fellow Salty 'Ham Cartooneesta Tim Rocks just did a stint as a caricaturist at the Alabama Adventure Theme Park? Well, he did. And now, for whatever reason, he has parted ways with them. I'm thinking they might be looking for somebody to fill the position, so if anybody's interested in caricature work this summer, you might ought to give them a call! Tim, if you feel like filling folks in on what it's like to draw those Alabama Adventurers, maybe you could do so in the comments below. I plan to tweak the drawings a bit more, add gutters between the panels, and ink it all nice-like. I may change out some of the hiccup cure gags in the first half of page 2, so if anybody has ideas for improvements in that department, let me know. 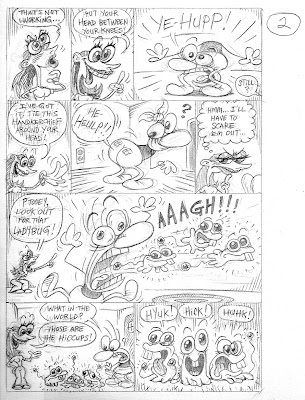 As you probably know, Ptooey & Loogie were invented for the use of all Salty 'Ham Cartooneestas. Maybe if we collectively do enough stuff with them, we could set up a web-comic or self-publish something. Here's a post about Cousin Cliff. He and my aunt Jane were big influences on me when I was a tot. I only knew Cousin Cliff through TV, but he still inspired me to draw.
. . . for the SHC list page. If anybody else wants to make a new thumbnail to go under their name, make it 2" high x 6" wide, at 72 dpi, and email it to me. ... and the hits just keep on comin'. Alison's the first one to take full advantage of the new "you can put up seven pictures" rule, and I think it makes her page look quite snazzy. You've got a lot of great work there, Ali! I couldn't figure out how to get SHC Lee Long's Flash animation to work on his page, so I let him put it here, in the sidebar (scroll down on the left, if you didn't see it). I reckon all y'all could showcase Flash animations down there, if you want. Just put them up online somewhere, and I can link them, the way I did his. For some reason, I can see Lee's little jumping cat when I view the page in Firefox, but not in Safari. What's up with that?
. 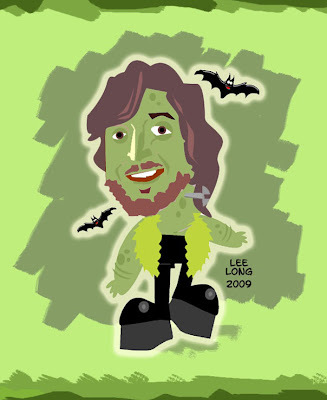 . . and Lee just sent me this awesome portrait of me as Frankenstein's monster! I'm flattered, because the monster is actually very smart, in the original book. Hey! - a :: WAyBaCk MaChINe :: for real. Dead websites are now brought back to life. Have you ever said to yourself, "dog-gone-it, self, I sure do wish that I would have kept a copy of those cartoon files that I created for www old-client-of-mine.com.net.org! ", if you are like me you probably say it, on a regular basis. 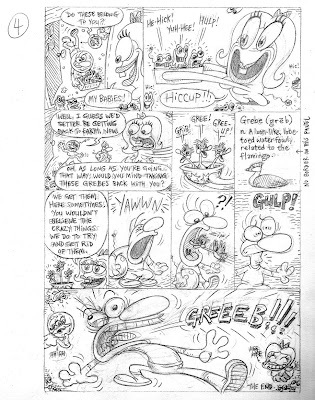 I was searchin' for some of my old art files online & came across the web archive, very cool. I even found one of my old websites, it's been dead for years, WOW! The fantastic people at Internet Archive, must have said it to themselves too, and found a solution. It is called the wayBack Machine and it freakin' Rocks Dude! Just point your browser to www.archive.org/web/web.php to see what you can find. Welcome new Salty 'Ham Lee Long! Visit his SHC page here. And go have a look at his Little Angel Comics, too! I've decided, now that we have the new SHC web site, that all y'all can have up to 7 images on your page . . . instead of just 3. So everybody let me know if you want to add some more pics. 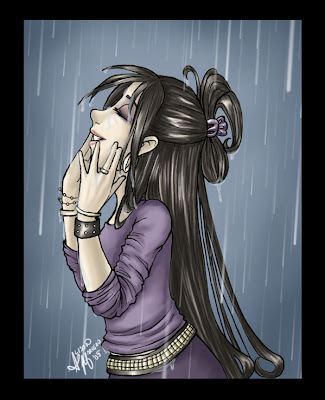 Sio already changed out some of her old art and added more: Sio's SHC page. Sio here, and this is my first blog post, tho I've been following it for some time. I've enjoyed seeing what all yall cartooneestas are up to, along with all the artistic Alabama happenings. 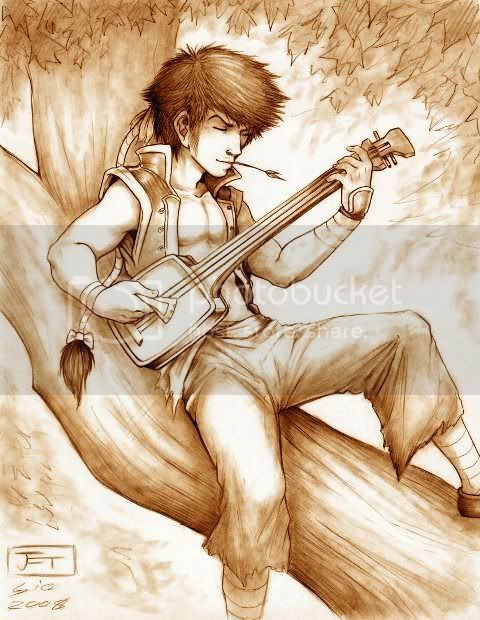 PFFbySIO.deviantart.com is where it's at and I invite you to swing by and check it out if you have the time! I'll be sure to announce when major updates are made. Besides that, I wish you all a pleasent Summer! 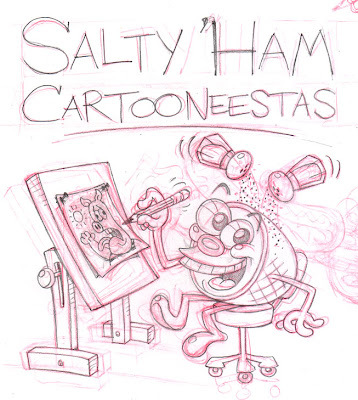 New SALTY 'HAM CARTOONEESTAS Web Site! There's still a long list going down the Cartooneestas page, but it's a little easier to digest, because there's just a thumbnail image representing each cartooneesta. I made these thumbnail images by assembling three old pieces from each artist. If you'd like to use something else for your thumbnail, instead of the quick collage I threw together for you, let me know. I know I want to make something special for my own thumbnail, when I can get around to it. The old site is defunct now; it just links to the new site. Please, if you've linked to the old site somewhere on your own sites, change that link to go to SaltyHam.org. Remember how SHC Brian Ratigan has that public access cable show, Final Broadcast? Well, don't forget to catch a new episode, tomorrow night! I'm told this one will have a bunch of animation, including the stop-motion puppet shorts I did back in college. (You can also see them on my youtube channel, but why be so new-fangled, when you can use an actual TELE-VISION MACHINE?) There will also be something by SHC Sam McDavid. Final Broadcast Trailer from ratigan on Vimeo. 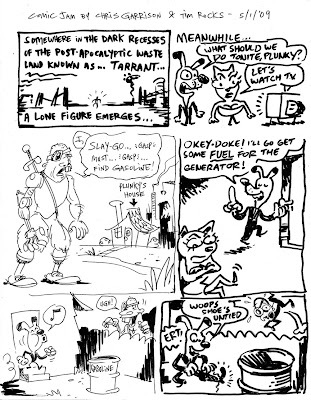 Salty 'Ham Comic Jam 001 resulted in The Secret Sorcerer, starring Ptooey and Loogie (final version on this blog, HERE, or read it on my comicspace page, HERE). On Friday afternoon, I invited Tim Rocks to join me at Barnes & Noble to try a spontaneous, 2-man comic jam. Over chocolate chip cookies, we agreed on a few rules. We decided that you can make your panel as big or as small as you like, and that you can suddenly decide that yours is the last panel of the story at any time. You can try to conform with the other guy's drawing style and story ideas, or you can throw them out the window, if you want. I brought some pencils, and Tim brought a nice fat marker that he wanted to use. I thought the marker, although fun, was too fat to draw the small details I wanted to put in. So I alternated between the marker and a regular black pen I happened to have. I drew the first panel, based on my experience of that morning, having visited Tarrant. We alternated panels of course, so I drew panels 1, 3, 5, and 7; Tim drew panels 2, 4, 6, and 8. I had anticipated that Slay-go would probably decapitate the little dog, or cut him in two, after which Plunky might appear and exact her revenge. But Tim subverted the violence in panel 6, and again in panel 8. At that point, I had a hard time figuring out what we might do next. I suggested that panel 8 actually kind of worked as a kooky ending, and Tim agreed, adding "The End!" at the bottom. So that's why the story comes to a rather abrupt stop. Nevertheless, I quite enjoyed working on it, and I think it's a fun read, and that it was worth doing. 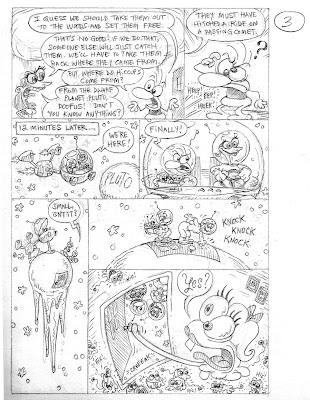 I think having two artists, instead of a whole bunch, probably helps the story stay at least a little bit more focused, as opposed to comic jams with more people, in which the stories are often all over the place. Hopefully I can organize more fun jams like this one in the future.